Large U.S. companies will most likely make greater investments in sustainability initiatives in the next five years, according to Business Green. Oil, gas, utilities and retail sectors are expected to drive most of the green spending. Energy management and environmental management will two areas of focus for corporations. Technology manufacturing and the electronics market are not known for being green, but IBM products are made from recyclable materials or can be safely disposed. 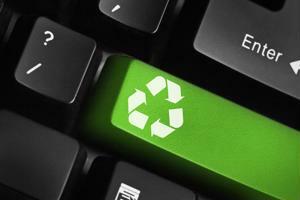 IBM scores high on environmental management. The company is a member of the Sustainable Agriculture Initiative, an organization that develops internationally recognized criteria for sustainable product sourcing and growing practices. Coca-Cola collaborates with farmers to increase production while decreasing environmental impact. The retailer uses electric delivery vehicles to improve green logistics and give customers environmentally responsible deliveries, making Office Depot one of the greenest retail organizations.